The Windows 10 Creators Update is due early this year, and Microsoft served up what you might call a hearty appetizer Monday morning: its massive Windows 10 Insider Preview Build 15002, with so many improvements that we will limit this article to a discussion of front-end changes. Build 15002 is being released for the PC only, as part of the Fast Ring of Insider builds. Be aware of a few bugs: Miracast connections won’t work, and the Netflix app probably won’t render video (instead, use Edge). Why this matters: Microsoft didn’t specifically mention the Creators Update in the context of the new build, but this truckload of features has certainly been added with that update in mind. All of this will probably arrive on non-Insider PCs later this spring. Here’s a short summary of the new front-end improvements in Build 15002, which we’ll break out in detail below. An unfortunate number of people used Microsoft Edge when it first came out—and passed on it. But the Edge team hasn’t stopped rolling out improvements, and there are two key ones: a tab preview bar, as well as a tool to resume tabs that you’ve set aside. ou’ll probably find the latter feature more worthwhile. Other browsers offer the ability to restore tabs when the browser crashes or you accidentally close the window. Edge calls this “setting aside” the tabs, adding an icon in the upper left-hand corner to do so, plus another icon to restore them. Edge also now offers a tab preview. Some browsers, like Opera, allow you to hover over a tab to project a small image of what the tab displays. Edge, on the other hand, now shows a little caret symbol to nudge your attention upward. Click it, and you’ll get a carousel of what each tab is currently showing. Windows 10’s new tab preview within Edge. Build 15002 offers one Edge feature everyone should like: auto-blocking Flash. Last year’s Anniversary Update auto-paused the infamously unsecure Flash. The new build goes a step further: It won’t load Flash at all unless you explicitly tell Edge you want to run it. Edge has one other subtle improvement: You can now launch either a standard browser window or an InPrivate window directly from the taskbar. It’s a small convenience, but a welcome one. It’s not officially time for spring cleaning, but Microsoft is allowing developers and users to spiff up the Start menu and notifications drawer. Windows 10’s new Start menu folders. Windows 10 phones already enjoy this feature: the ability to drop several tiles into a custom folder on the Start menu. Now Windows 10 Insiders will get it with Build 15002, and taking advantage of it is easy: Just drop one app on top of another, and name the subsequent folder. If you do so, though, you’ll lose the “live tile” effects of a standalone tile. Microsoft has also made it easier for developers to carve out custom subgroups inside your Notifications drawer, cleaning up that clutter. Occasionally when you redock your laptop, you may notice your desktop icons suddenly shift position randomly, or change size. Build 15002 tries to solve that problem, with an improved scaling option in Settings. Likewise, Windows now offers better placement support, as well as smooth resizing of desktop apps. Windows Ink also boasts a new, long-overdue stroke erase feature, handly when marking up web pages to share. Microsoft’s also made changes in how you can share the content from those apps. I use Windows 10’s built-in Snipping Tool to grab an image, but OneNote’s Win + Shift + S command can do the same thing. Sharing that snippet (or a web page, or some other piece of content) is more contextual, and the Win + H command has been removed. Microsoft is always updating Cortana, and remembering what exactly you can do is always a challenge. Cortana’s Notebook can help, as you can check out some of your available options in the various categories. Now, however, Cortana will auto-suggest commands based on what you’re typing, helping you figure out what you can do next. Reminders can also be scheduled monthly (finally!) for suggesting bill payments and other recurring events. Triggering Cortana, though, has changed: Gone is Win = Shift + C. Instead, the new command is a simpler Win + C, which should have been there in the first place. Microsoft previously allowed Windows 10’s built-in antivirus, Windows Defender, to share responsibilities with a second antivirus program. Defender has new options to run full, quick, or advanced scans, with a report on your PC’s health. The most notable change, however, is the addition of the Windows 10 Refresh Windows command within Defender itself. This is a fairly major undertaking, as Refresh Windows removes most of your apps, though not your personal data. Still, if your PC is running slow, Refresh Windows is a good fresh start. The negative effects of blue light at night aren’t well understood, but studies have suggested possible links to both obesity and cancer, as well as a disruptive effect on the circadian rhythms that help us sleep. Build 15002 now allows you to automatically lower the amount of blue light your PC emits after a given time, via a new menu within Settings. That’s just one of a number of Setttings pages overhauls. 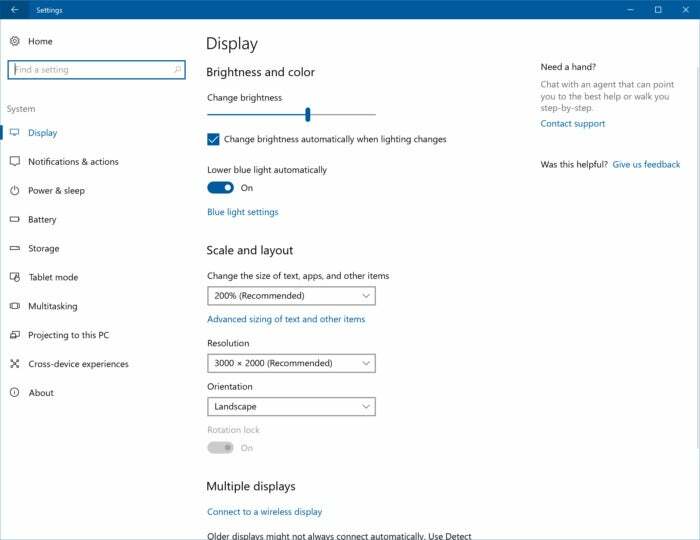 You’ll probably be equally pleased with the updated Display Settings options page, which restores the screen resolution controls to a prominent position. You’ll also find a new settings page for the Surface Dial, better theme management, and even an option to control “cross device” experiences—letting apps on your phone, for example, talk to the comparable apps on your PC. (Note: Microsoft said a bug in the new build currently prevents Cortana from working across your phone and your PC.) Finally, there’s a new Touchpad Settings page, where you’ll be able to create new groups for three- and four-finger swipes, and discover new gestures. Microsoft adjusted the Narrator shortcut to make it more “intentional” (and less easy to trigger accidentally) by changing it from Win + Enter to CTRL + Win + Enter. Narrator has also been added to the WinPE Windows setup environment, as well as the WinRE recovery environment. Braille support is en route to Windows 10, though it’s not quite functional, Microsoft said. I’ve seen several reports that the Share pane (click the circle-with-dots icon in Edge) now includes ads—or rather, icons for “shareable” apps that may or may not be of interest to you and may or may not cost you money. They're PUPs, in other words. You may have already heard about the Green Screens of Death. Microsoft is making BSODs on Insider builds green, so it's easier to answer questions. Don’t worry, your production machines will all go blue. There are promises of other improvements that haven’t arrived yet, including Cortana voice to step users through setup, Defender PC health scans, camera-detected Good-bye (“Dynamic lock”), Edge Web Payments, My People on the taskbar, and Hyper-V Quick Create. We’re getting down to the wire, folks. If Microsoft’s going to ship the Creators Update in April, those features need to be nailed down in the next couple of weeks.